Besides being home to a great wholesale accessories shopping street at Sampeng Lane and a beautifully designed boutique hotel at Shanghai Mansion, Bangkok Chinatown at Yaowaraj Road also hosts a few of the best dinner places in Bangkok. 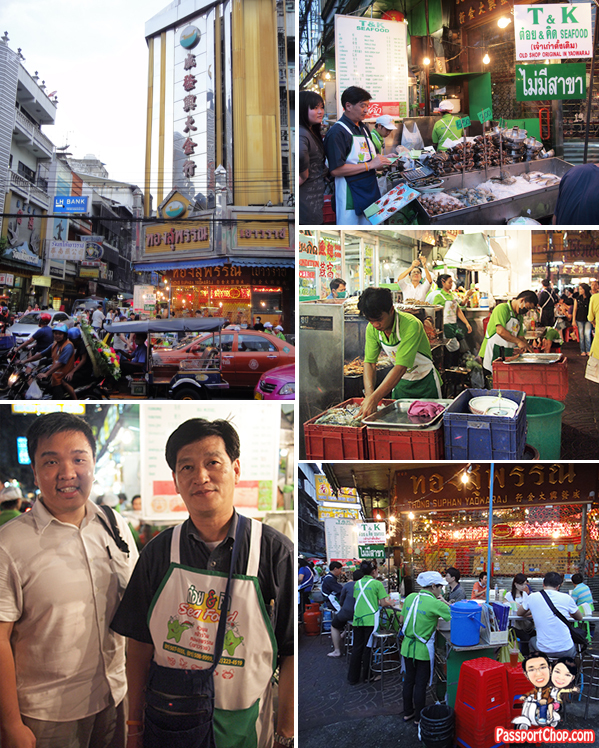 One thing you can be sure about Chinatown is that it is always crowded with people and cars, be it day or night – what’s really interesting is that the streets along Yaowarat Road (the main road cutting across Chinatown) transform their purpose from shopping to eating in the evening. The stalls selling knick-knacks, clothes and accessories closes at around 5pm and food stalls that had laid dormant during the day comes alive with its bright neon-lit advertising boards. 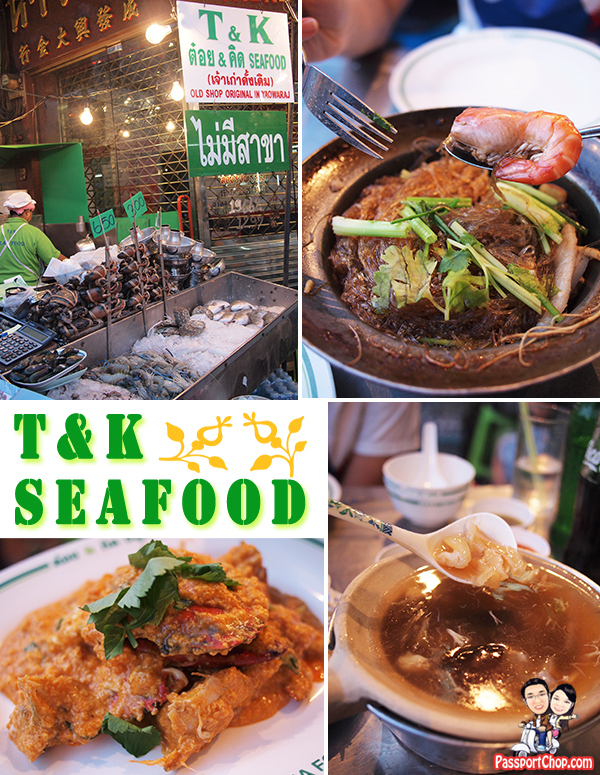 One of the most famous streetside stalls along Yaowarat Road is T&K Seafood. T&K Seafood is open for business only from 6pm onwards and operates right in front of a Chinese gold jewelry trading shop (which closes in the evening). Some of the must-try dishes are the Steamed Prawns with Glass Noodles (150 Baht) and the Stir Fried Meat Crab with Yellow Curry Powder (starts from 300 Baht for small to 450 Baht for bigger ones). Shark’s Fin Soup is available for 300 Baht for a small claypot bowl. Don’t worry about language barriers when ordering the food – there are great pictures of the food you can expect to enjoy and clear indication of the pricing in the menu – no service charges and funny taxes. You can choose to experience the authentic Bangkok streetside dining or enjoy your food in its air-conditioned restaurant. Both are just as crowded at around 7pm when the dining crowd starts to stream in. Affordable prices for great seafood coupled with friendly service are just some of the reasons why people flock here (about 10 minutes by car from downtown Bangkok) for dinner. Despite busily taking orders and collecting money, the boss of T&K Seafood (see picture below) still took the time to explain to us how to get to Saphan Phut Night Market (otherwise known as Victory Memorial Bridge Night Market) and how much to pay the Tuk-Tuk driver for a quick drive to the market (40 Baht). With all the red and yellow shirts riot issue over the past few years in downtown Bangkok, one can’t help but notice that just across the narrow Phadung Dao Road, there is another seafood stall – R&L Seafood (Rut & Lek Seafood) where all their staff are dressed in red (a huge contrast from the all-green staff of T&K Seafood. We haven’t had the chance to try R&L Seafood but it seems to be just as busy and online reviews of both R&L and T&K seemed to be that they are both just as good! Don’t worry about any Red & Green Shirts clash here – they are too busy serving and preparing food for hungry diners at their own place! Both T&K Seafood and R&L Seafood is located at a street corner at the intersection of Phadung Dao Road and the main Yaowarat (Yaowaraj in Thai) Road. Just look out for the huge yellow building (if you can read chinese – advertising gold market) and both seafood eating places are located there. Alternatively, if you are staying in Shanghai Mansion, just turn right from the main entrance and walk straight – you should see it within a few steps from the hotel. T &K Seafood Address: 49-51 Phadung Dao Rd, Bangkok. Telephone: (02) 223 4519. Open daily: 16:30 – 02:00. This map shows you where T&K Seafood is located in relation to Shanghai Mansion and Sampeng Lane. Just ask around – most locals in Chinatown know about T&K Seafood. After enjoying a sumptuous meal of seafood at T&K, the best place to cool down and nourish yourselves after a long day of shopping and exploring Bangkok had to be with a bowl of Nam Sing’s Bird’s Nest. And the best thing is you don’t have to walk far to find Nam Sing, the Head Office of Nam Sing Thailand is located just a few steps away from T&K Seafood! 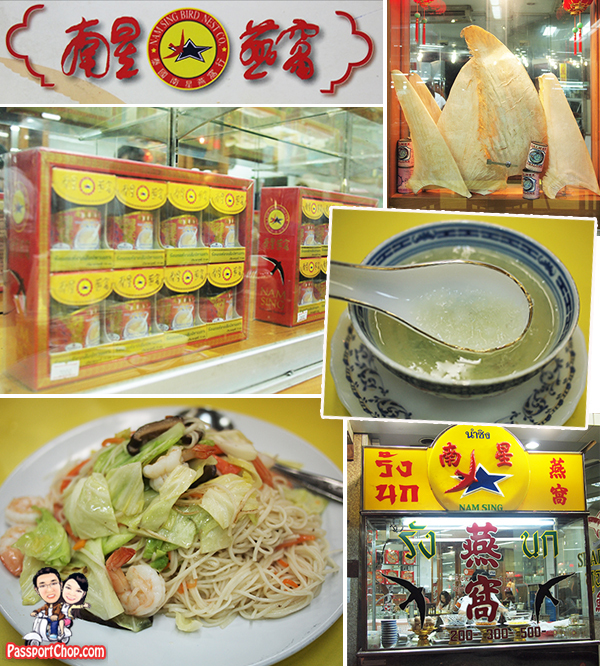 Here you can enjoy a bowl of Nam Sing’s Bird Nest and depending on your budget, you can pick 1st Class to 4th Class Nam Sing’s Bird Nest – a bowl of 4th Class White Bird’s Nest cost 200 Baht and the prices increases as you go up the class to 1st Class. We tried the 4th Class White Bird’s Nest and it tasted just as good as any bird’s nest we ever tried in Singapore and this cost us just less than 10 Singapore dollars – perfect for budget travellers looking for affordable and good food! If you are hungry, you can also try one of its many main dishes e.g. Fried Rice, Fried Noodle – we tried the Fried Noodle Hong Kong style for 200 Baht (relatively expensive as compared to other stalls in Chinatown and a tad too oily for our taste). I agree that its a bad idea but unfortunately it seems to be one of the most popular dishes in Chinatown. At last! Someone who understands! Thnkas for posting! How did Saphan Phut Night Market turn out? Was it any good? thanks! I am going to have to try the Crabs the next time I am in the area, it sounds like a little bit of heaven in Bangkok Thailand. saw that you mention that you dont realie fancy saphan phut nm.. Eh.. if that is the case, do u suggest going earlier (as i hear cabbie might not wanna take u due to the jam) for sampeng lane shopping and go for dinner at T&k and back to hotel or dinner at T&K then to saphan phut nm? Thanks for ur advise. we intend to travel on dec to bangkok, food at t&k expensive, last trip we unable to locate it we miss it. it is difficult to find. Zhi Qiang, the TK seafood is it air-conditioned or non-conditioned? there are both indoor and outdoor options – the former being air-conditioned and the outdoor – of course non air-conditioned by the road. The nearest BTS at Hua Lamphong (their MRT station) is quite away so I would advise you to take a cab here (if you want to save some money, you can take a cab from Hua Lamphong), although describing the location to the taxi driver might be quite challenging. I was totally disappointed with your recommendation in your blog regarding T&K seafood that very good. For me i try 5 dish that all i can said that are fail in taste . I never ever try so terrible seafood in my travelling life. I believe the only advantage of T&K are the price are compatible but not the taste of food. For Nam Sing Bird Nest -shark Fin we just order grade 3 bird Nest and for me i was satisfied with the taste and it’s worth for the value. so sorry to hear abt your experience with T&K seafood – we tried it 4 years ago and the food was great.